From April 15-19 Singulart will be donating all profits from our sales to Médecins du Monde, an international organisation dedicated to providing universal access to healthcare. To celebrate, we’ve decided to take a look back at the historical relationship between art and medicine. While most of us tend to think of art and medicine as two completely separate fields, many artists have been fascinated by the world of medicine throughout history. Likewise, medical professionals across the ages have depended upon artists to illustrate new medical ideas, procedures and techniques. Thus, many aspects of the arts and medical fields are inextricably linked. Here, we take a look at some of the works of art that have emerged from this historical relationship. You can also check out Exile, a collection of Singulart artworks curated by Médecines du Monde’s Head of Eurasia Pole, Elise Joisel. 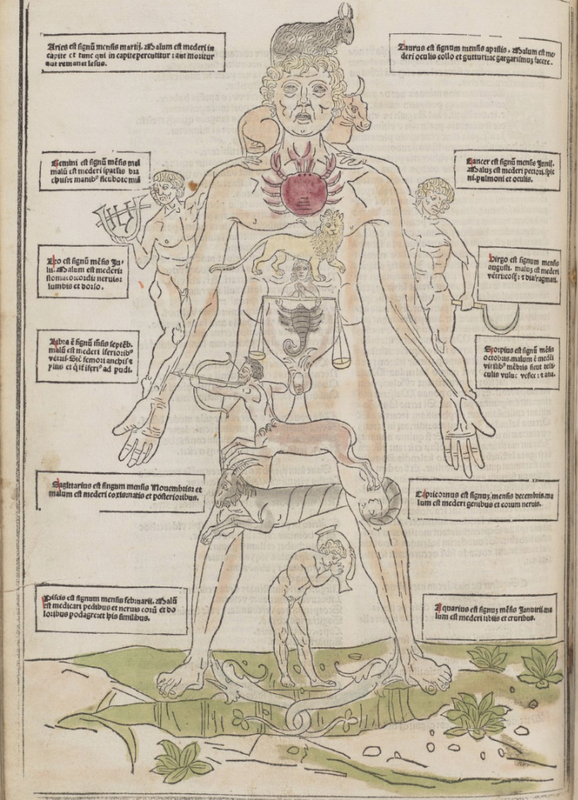 Known simply as The Zodiac Man, this is just one of many curious illustrations to be found in Fasciculus medicinae, one of the earliest illustrated medical books, published in 1491. As you can see, each of of the man’s body parts corresponds to a different zodiac sign. Using both the zodiac and the current phase of the moon, medieval doctors would calculate whether or not it was safe to draw blood from a certain area of the body. The book also features the first known illustration of a human dissection procedure as well as an anatomical drawing of a pregnant woman. Nearly a century later, a veritable magnum opus of a medical text was published in Italy by professor Andreas Vesalius. The Latin title, which translates to “On the fabric of the human body in seven books,” was an important milestone in the development of our understanding of human anatomy. Each of the seven volumes covered a different part of the body such as “Bones and Cartilage”, “Ligaments and Muscles,” and “The Heart and Associated Organs”. The images, as well as the information presented in the text, are based on Vasaluis’ lectures in which he would often dissected a corpse in front of his students. 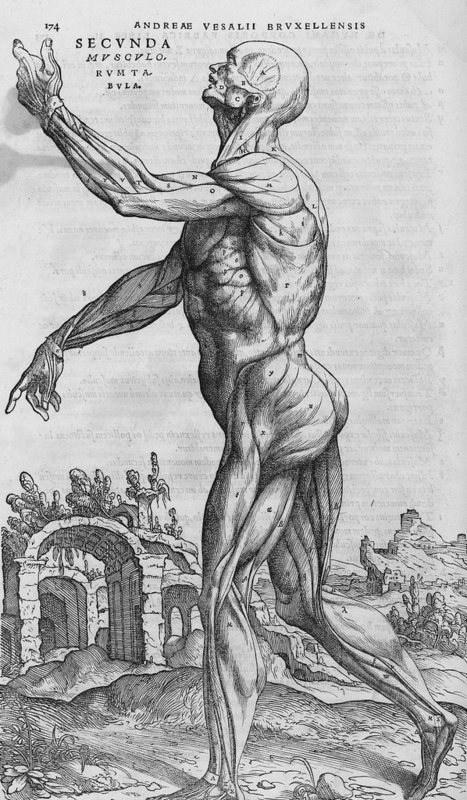 The illustrations are detailed and precise thanks to Vesalius’ intimate knowledge of the anatomy as well as the many technical and stylistic advancements in the visual arts that took place during the Renaissance. Illustration from De humani corporis fabrica libri septem by Andreas Vesalius (1543). 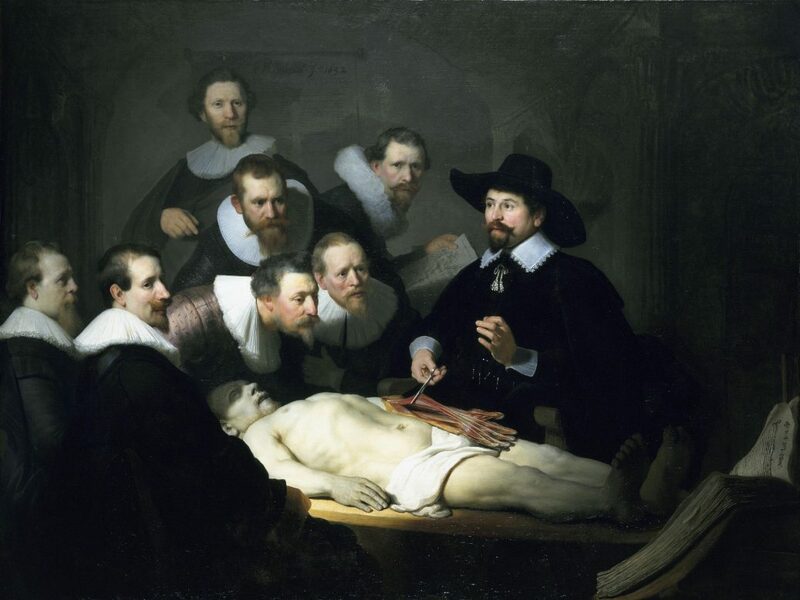 This 1632 oil painting by the dutch master Rembrandt depicts an anatomy lesson given by Dr. Nicholaes Tulp in Amsterdam. During the 17th century, members of the general public could attend lectures along with students by paying admission. The corpses used, including the one in this image, were those of executed criminals. Rembrandt’s painting is interesting for several reasons. First, each of the men included in the portrait would have payed a considerable sum in order to appear in the painting. Every five to ten years, the Amsterdam Guild of Surgeons commissioned a portrait from an up and coming artist. To be included in one was an honor that reflected the subject’s professional status. Second, Rembrandt did not paint a standard portrait but rather created a mise-en-scène, perhaps playing upon the fact that the lecture was taking place in a public theater. Finally, despite the dissected corpse, there are no cutting instruments to be seen. Instead, an enormous medical textbook sits open at the corpse’s feet, thought to be none other than “On the fabric of the human body” by Andreas Vesalius. 4. A tooth-drawer concealing the dental key from the patient. 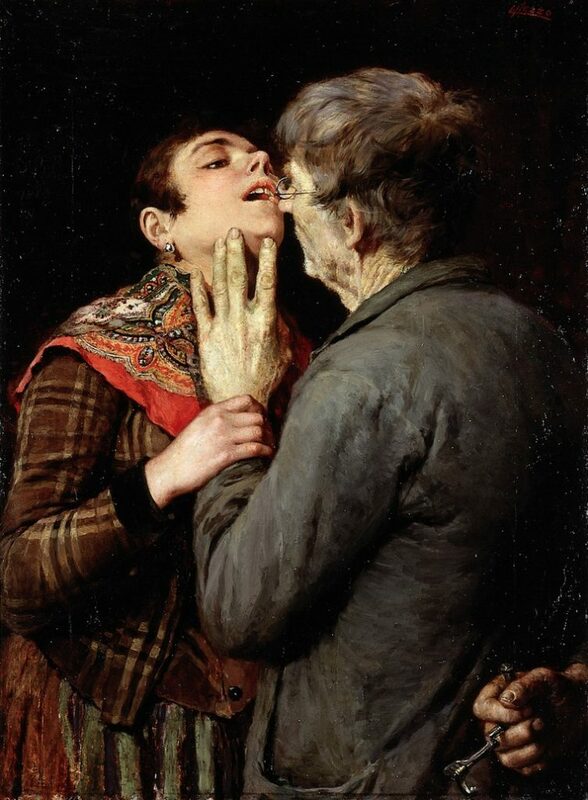 This 19th century painting by Luciano Nezzo shows a dentist examining his patient while concealing a medical tool behind his back. Presumably, the doctor is waiting for the right moment to surprise his patient with a dental key. Dental keys were painful devices used in the 1800s to extract damaged or rotting teeth from the mouth. The use of one would often leave a patient with a fractured jaw, serious bleeding, and gum damage. Without anesthesia, this doctor had to rely on the element of surprise to treat his patient. The painting tows the line between the humor and horror of 19th century medical practices. This beautiful print from the relatively-unknown illustrator Joseph Kuhn-Régnier, first appeared in the four-volume collection, “The Works of Hippocrates” published in Paris in 1934. Régnier’s characters are drawn in the style of Greek and classical art. In this image, a woman is being prepared for surgery by a nurse. Her legs are tied and restrained to stop her from moving during surgery. Physician Hippocrates, who is now regarded as the father of Western medicine, was active between 400-300 A.D., nearly 2200 years before the invention of anesthesia. The expression on the patient’s face tells us everything we need to know about what it would have been like to undergo surgery during the time of Hippocrates. These five works of art illustrate the highs and lows of medicine as it developed over the last 500 years. As our collective knowledge about human anatomy grew, artists ensured that advancements in medicine were recorded through their images. Just as medical textbooks today rely on highly-detailed photograph and diagrams, the first major medical texts relied on the best artists of their age to visualize the human body and it’s systems. It seems that the relationship between medicine and the arts is one that will stand the test of time.